This week we’ll be taking a deep dive into using Twitter marketing to build awareness around your events. I’ll try to cover everything related to Twitter marketing and how to employ it as a tool for event marketing. I’ve included a lot of information in this post, so if you already know about Twitter, or don’t care about seeing Twitter stats, please feel free to skip ahead. I’ve outlined the topics for you below. 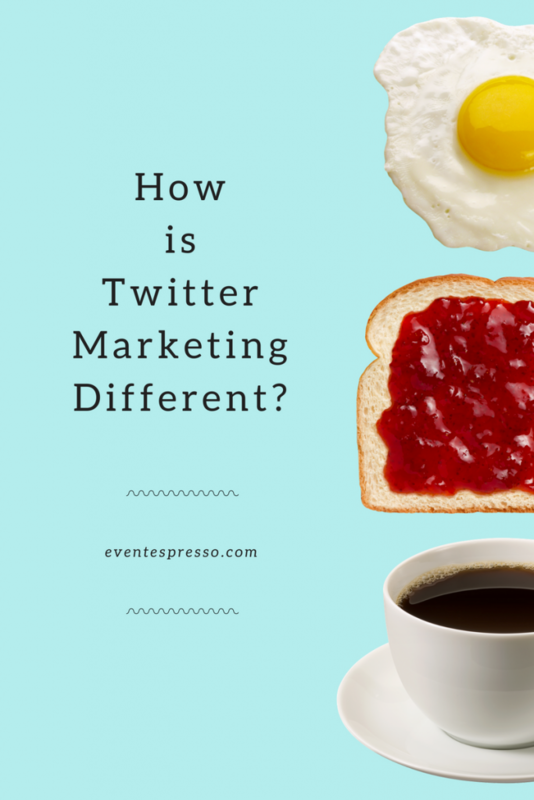 How is Twitter Marketing Different? Last week I covered Facebook Marketing in great detail. Make sure you check it out, especially if you to reach a wider audience than what’s on your email list. If you aren’t already aware, Twitter is a social networking and microblogging service, enabling registered users to read and post short messages, so-called tweets. Tweets are limited to 140 characters and users are also able to upload photos or short videos. Founded in 2006, Twitter turns 11 years old this year, making it one of the oldest of the social networking family. 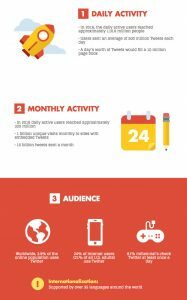 The platform’s 313 million monthly active users send more than 500 million Tweets every day. More importantly for marketers, Twitter users are actively discovering and interacting with businesses through the social network. Over 66 percent of Twitter users have found out about a new small or medium-sized business (SMB) through the network, 79 percent have retweeted an SMB, and a whopping 94 percent plan to make a purchase from the SMBs they follow. And that’s not all. Over 69 percent of Twitter users have already purchased from an SMB because of something they saw on Twitter. Why is Twitter Important to Events? Twitter has an enormous international presence, with 79 percent of its users living outside the US. It’s supported by 35 languages around the world, and the platform has also recently switched away from a live feed for a more tailored experience. It was found in 2016 that Twitter had approximately 320 million active users visiting on a monthly basis. The approach you take to every social media site should be different for each platform. For example, your Twitter marketing strategy isn’t going to be the same as your Facebook marketing strategy. Understanding how Twitter works and where it fits in the social media landscape will help shape the way you use it. As you can see, most of these activities have to do with interactions. It’s not necessarily just about broadcasting your content like Facebook, Instagram or Pinterest, for example. Twitter flourishes off of communication. 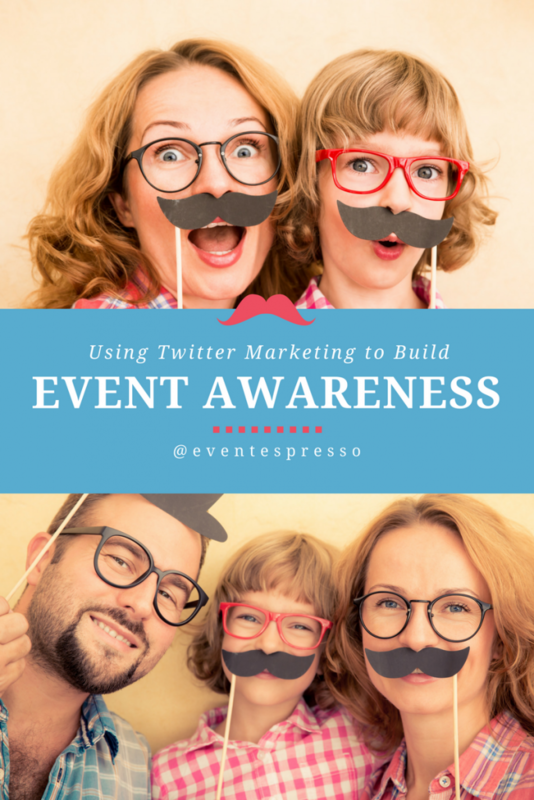 How can using Twitter marketing help your event marketing strategy? Twitter can help your event marketing strategy by allowing you to build interest in your events, as well as your event business. On Twitter, the follower relationship is not two-way; you don’t have to wait for someone to approve “your” follow request and vice versa. Your Twitter updates are public as well, meaning non-Twitter users can also view them. For event organizers, this means you can easily get a quick message out to people who are interested in your upcoming events, activities, or products. You can also use Twitter to get real-time feedback from event attendees, members, and customers. 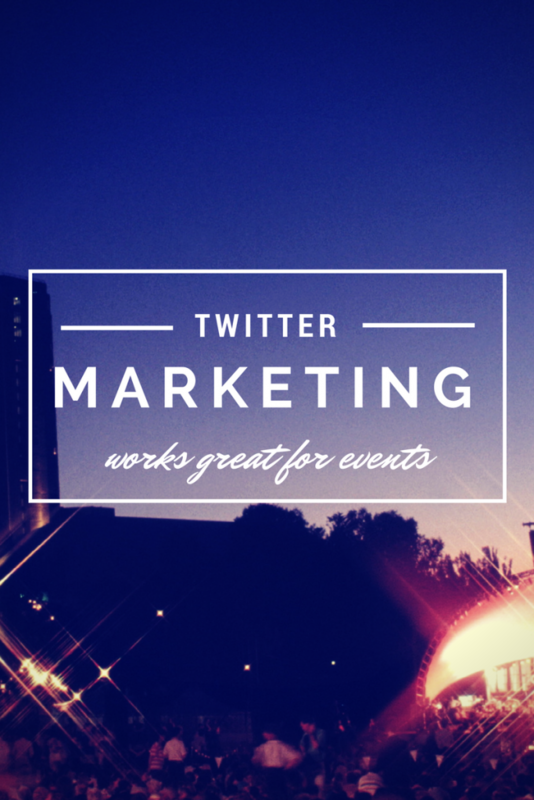 Nothing should stop you from using Twitter in your event marketing strategy. However, I think it’s fun to share a few pros, and cons about each social media tool I review. Easy to use – It’s easy to craft a post, and with the limited character amount, it can take less than a minute to get your event details out into the Twitter universe. Twitter is one of the best platforms for increasing brand awareness. A limited amount of space – Twitter only allows 140 characters, so if you have a lot to say it can be hard to squeeze it all into one short post. The number of fake user on Twitter is very high. In 2013, it was reported that approximately 5 percent of users on Twitter are fake. Fun little fact, in 2016 Donald Trump had the highest amount of fake Twitter followers, with 7.8 million fake followers. While Hillary Clinton came in second, with 5.93 million fake followers. People sometimes find it a bit confusing, with the @ signs, #tags, Twitter Lists, RTs, moments, trending topics, followers, stream, replies, mentions. 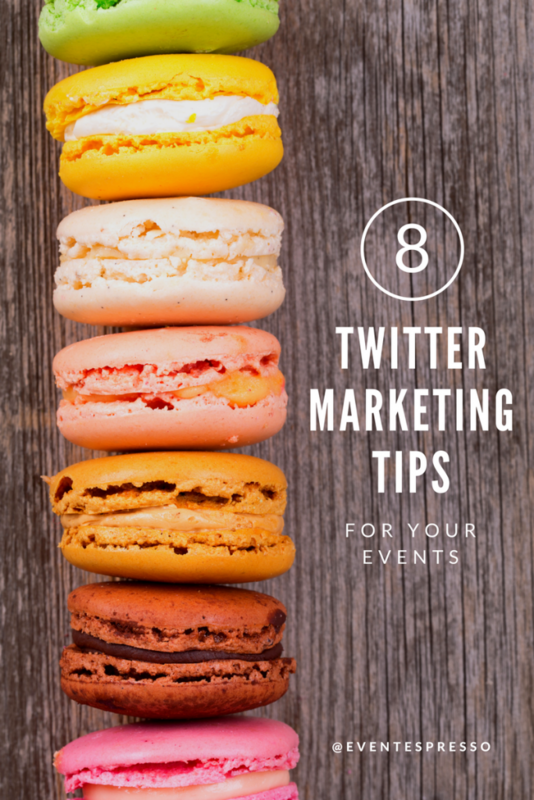 Here are some tips I’ve compiled to help you use Twitter marketing for your events (and your event business). If your event happened twice a year, keep the same page and only adjust the cover photo and profile image to reflect the upcoming show. Make sure to keep your page title and URL generic, and not unique to one year. While Twitter is fantastic for in-event engagement, you’ll need to use it before and after your event to maximize your social ROI with the platform. One of the many benefits of using Twitter is that it allows you to build and strengthen the many relationships that you have with your audience. Just make sure that you are taking the necessary steps to engage your followers throughout all stages. Leading up to your event, Twitter is a great resource to help gain additional followers, attract attendees, conduct customer service inquiries, and give your attendees something to look forward to by offering sneak a peek at what’s to come. During the event itself, use Twitter to interact with attendees that are physically present at the event by live tweeting and using event-related hashtags. This also helps to keep non-attendees (those who weren’t able to attend the event in person) engaged and informed. For example, when I can’t physically attend an event I am interested in, such as a WordCamp, I can easily follow the Twitter stream, using a hashtag to keep up with the live event happenings. After the event, you can use Twitter to share content, solicit feedback from attendees, reflect on the overall experience and create an impression that will last far beyond the event itself. From the Twitter website, a list is a curated group of Twitter accounts. You can create your lists or subscribe to lists created by others. Viewing a list timeline will show you a stream of Tweets from only the accounts on that list. The right Twitter list can help you locate, monitor and interact with the right people quickly. You can sort individuals or brands that interest you into Twitter lists (which can be public or private). Once you’ve added a user to one of your Twitter lists, you can easily see what they’re posting and sharing. Staff directory for your team — Find all your employees who are on Twitter, and collect them into a list. Client list (keep it private) — You may want to put together a collection of your past attendees/customers so that you can stay abreast of their activities and what they’re sharing on social media. For agencies and marketers especially, it could be very helpful to see the types of updates—both the quality and the content. “Notice me” list — This is a list of Twitter users whom you wish would see you and, eventually, follow you. Putting them here on this list is your way of tracking with their updates, engaging with their tweets, and hopefully getting a follow. Competitors list (keep it private) — Keep tabs on the others in your industry who do what you do. See what type of content they share on social media, and take inspiration from the way that they compose their updates. Industry sector — Similar to the competitor’s list, the industry sector includes any and all Twitter users who work in your field, not just the ones you directly compete with for customers. Thought leaders in your industry — Who are the people in your industry/niche who always seem to be on the bleeding edge with ideas and articles? Add these thought leaders to a list. Your fellow event professionals/designers/coders/etc. — The idea is to get insight and feel a connection with others who are doing the same day-to-day job as you. It’s likely that you’ll share a lot of the same workflows, tools, and highs and lows, and collecting these accounts into one list makes it all the easier to connect and engage. Your interests and categories — Twitter lists are the perfect way to group together users and accounts based on the topics you’re interested in and the categories you follow. These lists can be sports teams, comedians, authors, deal websites, and anything in between. Whatever you’re interested in, make a list out of it so that you never miss a tweet. Unlike most social networks, Twitter doesn’t curate the content you see by using an algorithm. Instead, the reverse chronological timeline displays Tweets from everyone you follow in one continuous stream. The sheer volume of tweets means that a single tweet about your upcoming event is expected to be missed by a large number of your followers. Don’t be afraid of tweeting the same content more than once. In fact, one study suggests that the second or third tweet relating to a particular topic may perform better than the first. While it may be a good idea to publish several tweets pointing to the same event content, making sure the text and image of the tweet are different each time ensures that your feed looks more engaging and entertaining. This method of sharing also allows you to analyze the types of Tweet that are most successful, by looking at clicks and engagement in an analytics platform, such as Google Analytics or Twitter Analytics. A majority of your attendees may be live-Tweeting throughout the day, so this is also an excellent opportunity to engage your participants and leave a lasting impression of your event. As mentioned above, in the previous tip, it’s also a great strategy to get those involved that weren’t able to attend in person. Overall, keeping your company’s Twitter feed active throughout your live event is essential to ensuring the success of your Twitter campaign. On the day of your event, you may want to designate a person (or people) to manage your company’s Twitter account. This individual will have several responsibilities, including posting tweets, quoting speakers, answering attendee questions, sharing photos and videos, making announcements, re-tweeting good posts, and more. 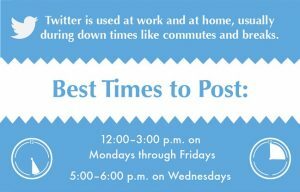 Last, but not least, find out the best time to post for your business. People log in to Twitter on both mobile devices and desktop computers, both at work and at home. 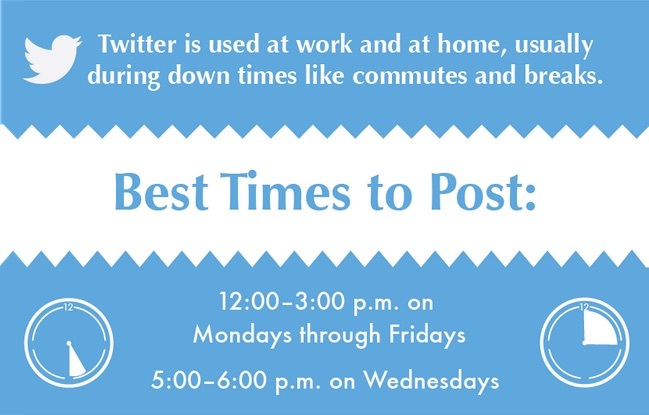 According to Hubspot, the best time to post on Twitter is 12:00-3:00 p.m. on Mondays through Thursdays, and 5:00-6:00 p.m. on Wednesdays. However, these might not be the best times to post for you, especially if you want to engage with potential attendees. Which brings us to. 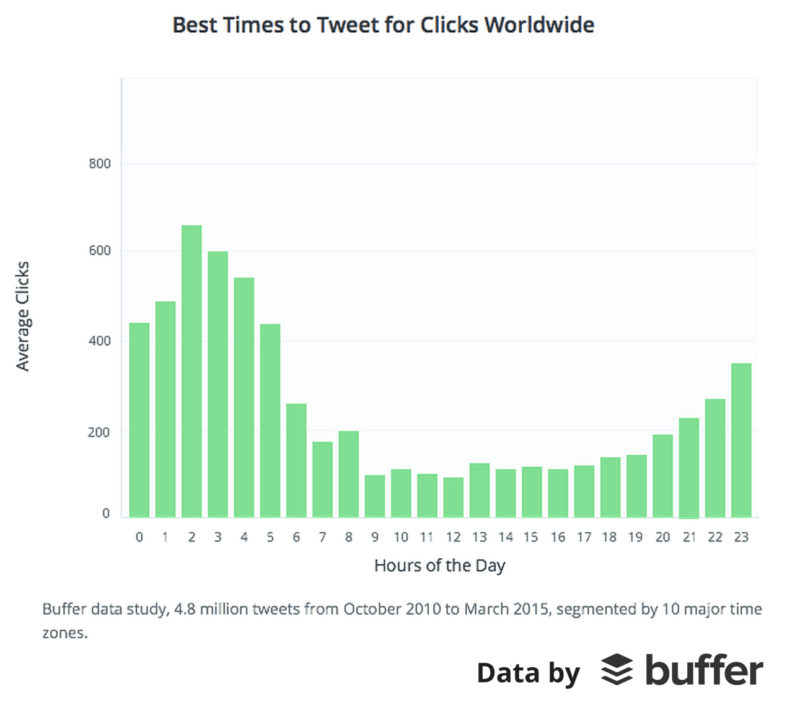 Buffer , a scheduling and analytics app for the major social platforms, analyzed all of the tweets that have been sent through their service since October 2010, giving them over 4.8 million tweets to examine. What they found, is that people love to tweet and eat. 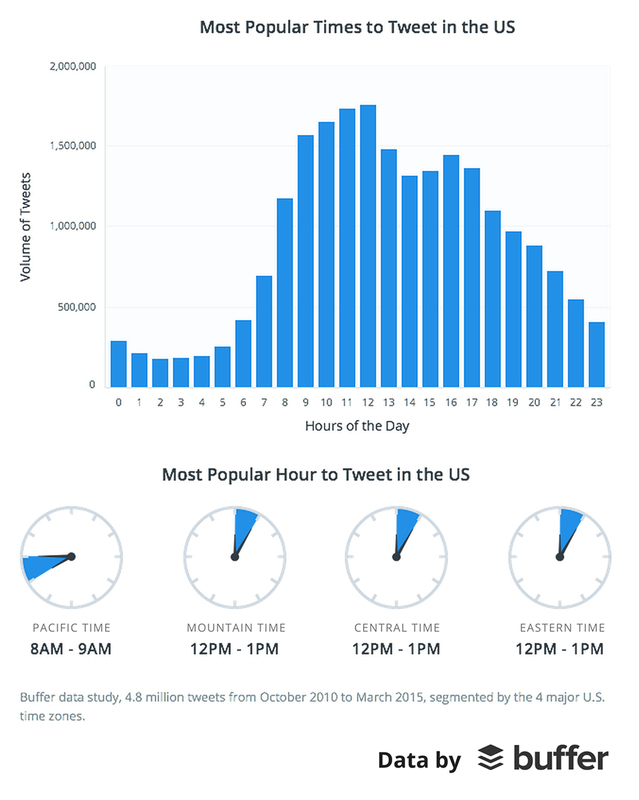 Noon to 1 p.m. is probably the most popular time to tweet. However, it’s not necessarily the most productive time to tweet. With so many tweets blasted out every minute, it’s easy for yours to get lost in the mix. 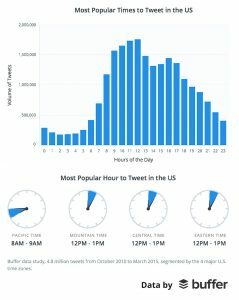 As you can see in the related image, the most popular times to tweet seems to be 8:00-9:00 a.m. Pacific Time and 12:00-1:00 p.m. in Mountain, Central, and Eastern Time. So you need to know your delegates fairly well. 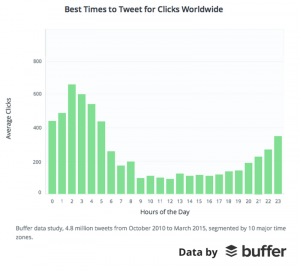 “In many cases, 70 to 80 percent of total engagement comes from clicks,” says Kevan Lee of Buffer. 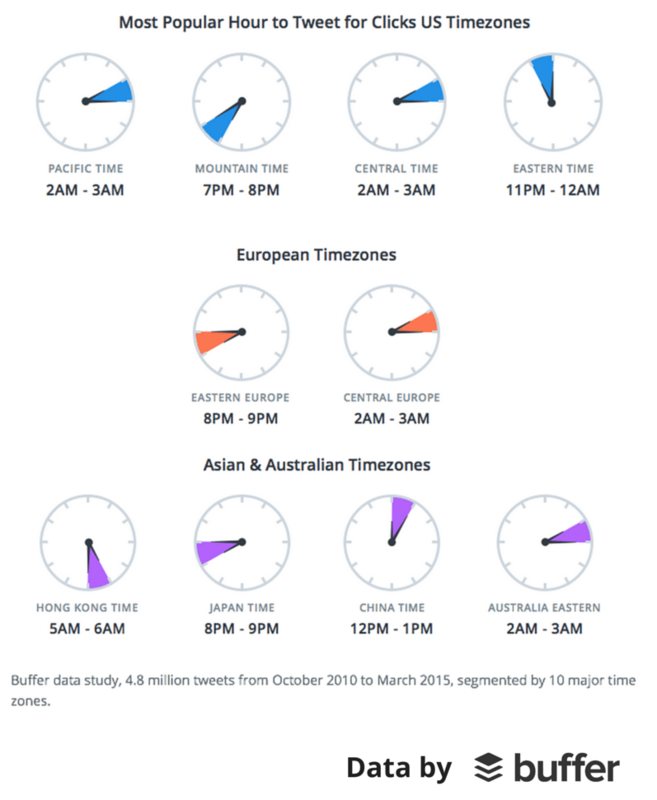 The highest amount of engagement per tweet occurs between 11 p.m. and 5 a.m., peaking between 2 a.m. and 3 a.m.Tweet when fewer people are tweeting to increase your chances of being noticed. Denver, Salt Lake City, Pocatello, etc. (Mountain Time): 7 p.m.
Chicago, Detroit, etc (Central Time): 2 a.m.
Here’s a list of instruments I’ve compiled to help you tweet efficiently. 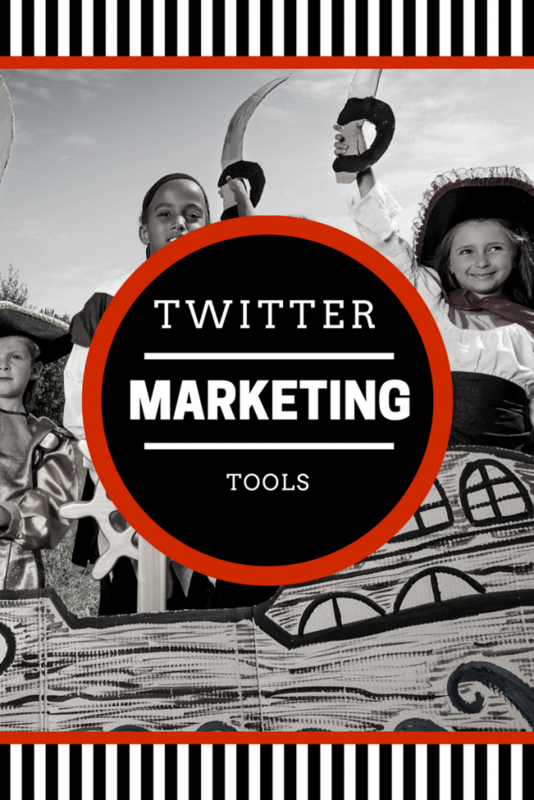 We use many of these tools in our Twitter marketing strategy as well. 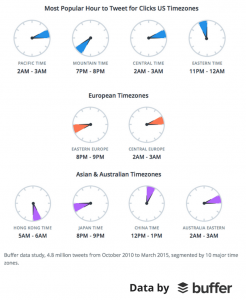 Buffer — As I mentioned above, this tool is a scheduling and analytics app for the major social platforms. We use Buffer to schedule and post tweets to our @EventEspresso Twitter account. TweetDeck — A social media dashboard application for management of Twitter accounts. TweetDeck consists of a series of customizable columns, which can be set up to display your Twitter timeline, mentions, direct messages, lists, trends, favorites, search results, hashtags, or all tweets by or to a single user. HootSuite — A social media management platform. The free version gives you a few basic analytics and the ability to schedule posts, similar to Buffer. FollowerWonk — This tool allows you to search Twitter profiles using queries like job title, location, or keywords mentioned in a user’s Twitter bio, which can be useful if you’re looking to grow your events community or find additional attendees for your event or connect with new influencers in your niche. Better Click to Tweet — For WordPress users, this plugin allows you to create tweetable content for your readers quickly. By using a simple shortcode, your selected text is highlighted and made tweetable. We use this tool on our website (eventespresso.com). If you’ve made it this far, there’s no question that you know the importance of keeping everyone engaged before, during, and after your event. You know that sharing information about your events, at all stages of your event can, and will increase exposure and build awareness around your event. Hopefully, you have a deeper understanding of Twitter marketing and can see how effective Twitter can be for sharing information about your events, updates with your attendees, and keeping everyone engaged before, and after your event. Do you actively make an effort to integrate Twitter Marketing with your events? I’d love to hear why or why not in the comments below.